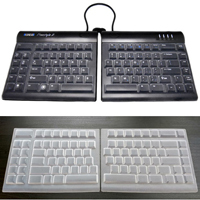 The Freestyle2 Ascent Accessory Kit is a specialized accessory for the Freestyle2 Keyboard. With the Ascent Accessory installed, the Freestyle2 Keyboard becomes an option for those whose inability to pronate (i.e. who cannot hold their hands in a "palms down" position without discomfort or pain) requires a keyboard tenting angle greater than the 15° offered by the V3 and VIP3 accessories. The Ascent Accessory allows the left and right modules of the Freestyle2 Keyboard to be tented independently of each other, in 10° increments from 20° to 90°. Users who choose this solution must be touch typists (as they will be unable to see the keys). It is also strongly recommended that they have arm support while typing to avoid straining the muscles of the shoulders and upper back. Arm support is especially important at higher degrees of elevation. The Ascent Accessory can be used with Palm Supports (sold separately) at angles up to 40°. The 20" separation cable is typically recommended for this accessory as it provides the recommended flexibility. An optional linking plate (included with the Ascent Accessory Kit) may be used if desired to connect the two tenting modules for increased stability. The 3M Gel Wrist Rest for Keyboard is designed to reduce pressure against sensitive tissues on the underside of the wrists. 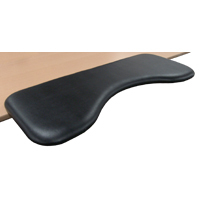 Properly positioned beneath the heel of the hands, the Gel Wrist Rest also elevates the wrists above the desk surface and helps to prevent the upward bend of the hands known as wrist extension. 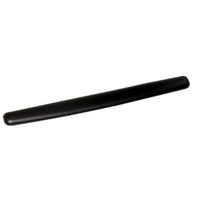 At 19.0" long by 2.8" wide and 0.75" thick, the Gel Wrist Rest for Keyboard is compatible with conventional, rectangular (non-splaying) keyboards. Made of 25% recycled materials, the wrist rest is filled with comfortably resilient gel and covered with smooth leatherette. Embedded antimicrobial protection helps to keep the surface hygienic. The 3M Gel Wrist Rest for Keyboard and Mouse is designed to reduce pressure against sensitive tissues on the underside of the wrists when using the keyboard and when mousing. Properly positioned beneath the palm of the hands, the Gel Wrist Rest also elevates the wrists above the desk surface and helps to prevent the upward bend of the hands (i.e. wrist extension) that is a known risk factor for injury to the wrist and hands. 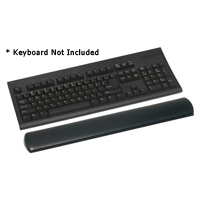 The Gel Wrist Rest for Keyboard and Mouse is compatible with rectangular (non-splaying) keyboards and, at 25.0" long, is able to span the distance between the outer edge of a conventional 18" keyboard, to the outer edge of a mouse pad. Made of 25% recycled materials, the wrist rest is filled with comfortably resilient gel and covered with smooth leatherette. Embedded antimicrobial protection helps to keep the surface hygienic. The Maxim Palm Support Accessories are replacement Palm Supports for the Maxim Keyboard by Kinesis. Palm supports prevent wrist extension when using the keyboard. The Palm Supports on the Maxim Split Adjustable Keyboard are bundled with one pair of self-adhesive, silver Palm Pads for comfort. The Palm Supports are also detachable and can be removed if desired. 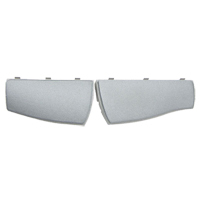 The Maxim Palm Pads Accessories are replacement Palm Pads for the Palm Supports on the Maxim Keyboard by Kinesis. The pads are approximately 0.125" thick and made of closed-cell foam covered with woven nylon fabric for comfort, long wear and easy cleaning. 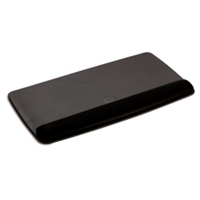 Measuring 13" wide, the Trapezium Wrist Rest Compact from Bakker Elkhuizen is designed to be used with laptop and notebook computers, or with compact keyboards. 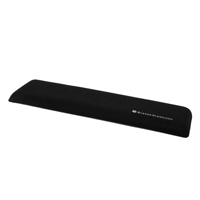 The Trapezium Wrist Rest is made of eco-friendly recycled rubber with embedded antibacterial properties. At 0.5" thick, it works especially well when paired with the deeper housing of a mechanical keyboard. Note: Please note we are unable to offer our 30 Day Customer Satisfaction Guarantee on this product. The Gel Keyboard Wrist Rest from Aidata is designed to cushion sensitive pressure points on the underside of the wrists. Measuring 19" wide by 3" deep and 0.9" thick, the wrist rest is compatible with rectangular (non-splaying) keyboards. The interior is filled with soft gel and the exterior is covered with smooth Lycra fabric. A non-skid backing keeps the wrist rest in place on the desk or keyboard tray. The Posturite Keyboard Rest supplies forearm support in environments where appropriate support is either absent or insufficient. It can also help users reduce the risk of wrist extension by serving as a functional palm rest. The leatherette covered 9" deep by 22.5" wide support is comfortably padded to reduce the potential for pressure points on the forearms. 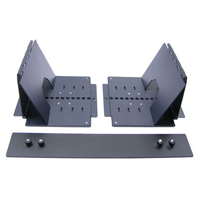 A convenient clamp-free mounting system (designed for use on desk tops approximately 1" thick) enables the Posturite Keyboard Rest to be easily repositioned as needed or fully removed. Users of sit-stand desks may also find the Posturite Keyboard Rest offers relief to the shoulders when they are standing. The keyboard rest supports the weight of the arms that would otherwise be borne by the armrests of a chair. Caution: The Posturite Keyboard Rest elevates the forearms up to .75" over the desk height. Be sure to take this measurement into consideration when establishing the correct height for a seat, or when adjusting the height of a sit-stand desk. The Freestyle2 Keyboard Cover from Kinesis offers protection from dust, spills, food, etc. Each of the two transparent silicone covers fit firmly over each half of the Freestyle2 Keyboard, with or without the palms pads attached. The soft, durable skin provides a natural feel for comfortable typing. 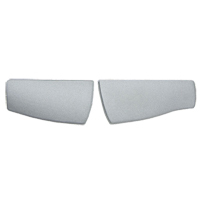 The silicone cover is fully washable and can be easily removed for cleaning or disinfecting. Le Freestyle2 Keyboard Cover de Kinesis offre une protection contre la poussière, les déversements, la nourriture, etc. Chacune des deux couvertures en silicone transparentes s'adapte fermement sur chaque moitié du clavier Freestyle2, avec ou sans les coussinets de paumes attachés. La peau douce et durable procure une sensation naturelle pour la dactylo confortable. La couverture en silicone est entièrement lavable et peut être facilement retirée pour le nettoyage ou la désinfection. The 3M Gel Wrist Rest Platform for Keyboard is designed for users who want to reduce wrist extension (i.e. an upward bend at the hand) with its associated risk of injury to the wrist and forearms, when working with a conventional keyboard at a seated or standing workstation. The platform is placed directly on the desk surface to provide a base for the keyboard. 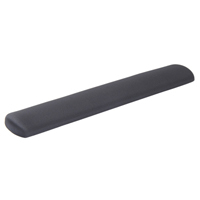 The gel wrist rest is secured to the platform in front of the keyboard, providing support beneath the heel of the hands to keep the forearms, wrists and hands in comfortable alignment when typing. Two sets of optional rubber feet are included, and can be attached to the underside of the platform to create either 5° or 10° of negative tilt for the keyboard to provide further insurance against wrist extension. At 19.5" wide, the platform and wrist rest accommodate standard keyboards with built-in numeric keypads. The wrist rest is 0.25" thick and made of gel-filled leatherette embedded with antimicrobial properties to inhibit the growth of bacteria.